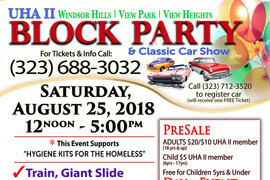 Welcome to our event page for the UHA II Block Party serving the communities of Windsor Hills, View Park and View Heights taking place on Saturday August 25th from 12 noon until 5pm. This is an event for the entire family and all are welcome. Join us and our neighbors for a day of live jazz, DJ and dancing, a classic car show and fun activities for the kids and family… including rock climbing, a giant slide and train rides. Enjoy delicious food from some of L.A.’s top gourmet food trucks available throughout the day from 12 noon until 5pm. Meet some of our local community businesses, large and small, who will be sharing various services and products, including new businesses that you may not yet know about. See ticket prices below and make your selection. If you are already a member of UHA II and log into your memberplanet.com UHA II account, you can purchase adult tickets for the 50% discount price of $10. If you are not a member, you can join now to get the 50% discount on adult tickets by following this link and creating your UHA II membership account http://mp.gg/8z24c. After you join, come back to this event page and then you'll also be able to purchase your adult block party tickets for $10 instead of $20. If you don't want to join then just go ahead and purchase the $20 adult ticket(s). This event supports the Hygiene Kits for the Homeless program. Help us help the homeless by supporting this event and make our community better and even more beautiful than it already is by joining together. Put this block party on your calendar now so you don't forget and come out for fun with friends and meet some new neighbors. Look forward to seeing you! Roy Johnson is the homeowner at 4943 Vista De Oro Ave.